Crisp audio from a lost 1963 BOB DYLAN concert has been unearthed in an attic and will be released as a bonus to fans who snap up the folk rock icon's new BOOTLEG SERIES VOL. 9 online. 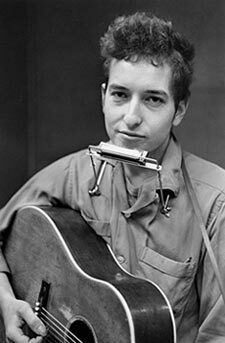 Amazon.com customers who order the new Dylan set will also get the live recording of Dylan, taped at the Brandeis University Folk Festival. According to Rolling Stone magazine, the audio sat in the archives of the publication's co-founder Ralph Gleason’s collection for over 40 years until his son Toby found it while clearing the family home after his mother's death. Toby Gleason says, "It’s a seven inch reel-to-reel that sounds like it was taped from the mixing disc. A collector/dealer associate of the family said, 'This might be worth something to the Dylan office,' and we sold it to them last year." Gleason has no idea how his late father came into possession of the tape: "My father had nothing to do with that Brandeis show. I suspect he got the tape from Bob himself or from one of the people in Bob’s organisation. My father was one of the nationally credited writers that wrote about Bob the most, and they became close."